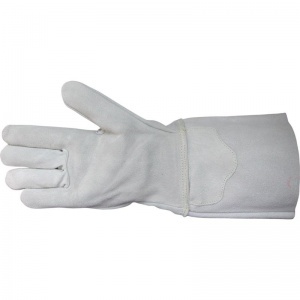 The Leather Presswork Gloves with Extended Cuff PK55-G4 are a superior chrome leather gloves with knitted wrist made from top quality split shoulder leather. 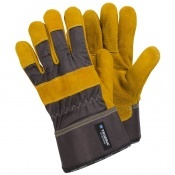 These presswork gloves also feature a completely seamless cut resistant lining knitted from high tech yarn and fully sewn with genuine DuPont Kevlar thread for greater strength. 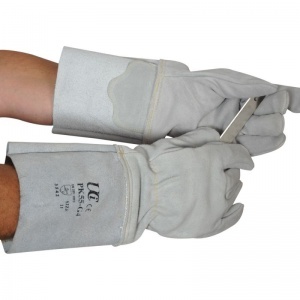 The Leather Presswork Gloves with Extended Cuff PK55-G4 provides superior mechanical performance, designed specially for the toughest jobs in the presswork industry but suitable for a multitude of other demanding applications. 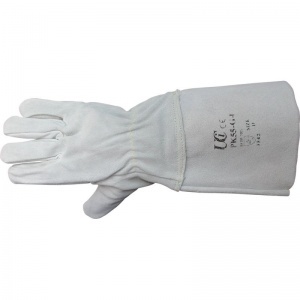 The product code for these gloves is PK55-G4. Heavy handling of dry or oily materials where there may be sharp edges. The Leather Presswork Gloves with Extended Cuff PK55-G4 have been sized according to EN 420, which governs a range of features about gloves including standardised sizing. Please measure the circumference and length of your hand and see below for the size of glove that is necessary. 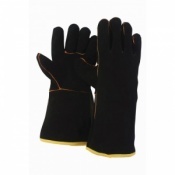 This glove is only available in size 11, a size that should be suitable for the majority of users. Please refer to the table below for more information regarding sizes. 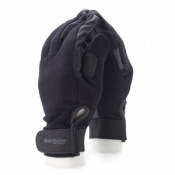 Please find the user instructions for these gloves by clicking the PDF link below.